Merseytravel and the National Trust are continuing their joint partnership to provide a direct bus service to Speke Hall this Spring and Summer. The Speke Hall Shuttle will run non-stop between Liverpool South Parkway Station and Speke Hall on Saturdays, Sundays and Bank Holidays from 6th April to 9th September 2012. Jim Barclay, Merseytravel Interim Chief Executive said: “We are pleased to be able to support this service, providing a link for visitors between Liverpool South Parkway and Speke Hall, enabling them to travel all the way by public transport. The Speke Hall Shuttle is a fully accessible single decker vehicle and will depart from Liverpool South Parkway station every half hour to Speke Hall, from 10:38am. 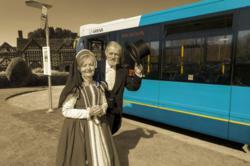 The last bus leaves Speke Hall at 1650. Merseytravel local passes, English National Concessionary Travel Passes, Solo, Trio and Saveaway passes are all welcome on the service. The fare is £1.10 Adult/50p Child. For more information and a timetable, ring Traveline on 0871 200 22 33 or go to http://www.merseytravel.gov.uk and click on the link on the homepage. Speke Hall is open Wednesdays - Sundays, 11am - 5pm, and Bank Holiday Mondays. (Please note entrance to house between 11am - 1pm is by guided tour only and tickets are issued on a first come first served basis).